This article is about the god. For the location that bears his name, see Red Mountain. Dagoth Ur, also known as Voryn Dagoth and the Sharmat, was the immortal Lord High Councilor of House Dagoth, who dwelt beneath Red Mountain with his kin, the Ash Vampires, and legions of Corprus monsters. As a mortal, Lord Voryn Dagoth was one of the few who knew about the Heart of Lorkhan, together with Vivec, Almalexia, Sotha Sil and their leader Lord Indoril Nerevar. Dagoth claimed that the Dwemer high priest Kagrenac was drawing power from the Heart using special tools to create a mechanical god, Numidium, that would be used against the Chimer. After Azura confirmed Dagoth's story, action was taken to stop the Dwemer, starting a war that culminated in the disappearance of the Dwemer and the transformation of the Chimer into the Dunmer. Following the defeat of the Dwemer, the Tools of Kagrenac the Master Craftsman fell into the hands of the Chimer, and Lord Nerevar held the burden of deciding what to do with them. At first, Dagoth himself urged for their immediate destruction, either of the Tools or the Heart itself, which led Nerevar to believe he could be trusted to guard them while Nerevar consulted his councilors, the Tribunal of Vivec, Almalexia and Sotha Sil (and the Dunmer's Daedric patron Azura). Sadly, when Nerevar and the Tribunal returned to Red Mountain with the conclusion that Kagrenac's Tools should be preserved but never used, Dagoth refused to give them up, maintaining that he had been entrusted to guard them. Unbeknownst to them at the time, Dagoth had experimented with the Tools on the Heart during Nerevar's absence, and somehow managed to steal some of its divine essence and power. He now called himself Dagoth Ur, and was forever after known by that name (it's possible Nerevar may have actually coined the name). Nerevar and the Tribunal's guards defeated Dagoth Ur, who was driven off and thought to have been killed. His House ceased to exist; the remnants were either killed or absorbed into the other Great Houses (although it would be resurrected later). However, Nerevar was mortally wounded and died shortly afterwards. Some sources insist that Nerevar died at the hands of the Tribunal, that they murdered him when he left Red Mountain to consult with them, and it was they who fought Dagoth Ur for the Tools, and Dagoth fought to avenge Nerevar's death. These assertions were vehemently denied by the Tribunal Temple, as well as Vivec; even Dagoth Ur's account contradicts this, as he admits that he and Nerevar came to blows beneath the mountain. Regardless, the Tribunal did not obey Nerevar's dying wish: years later, when Sotha Sil had learned their secrets, the Tribunal returned to Red Mountain and used Kagrenac's Tools to steal divine powers for themselves. Dagoth Ur also managed to forge a connection to the Heart somehow: he remained alive and immortal, albeit temporarily bodiless and presumed dead. The Tribunal's ambition proved to be disastrous, despite the many great and heroic deeds they accomplished in their divine states. In 2E 882, as the Tribunal journeyed to Red Mountain to renew their connection to the Heart in a bathing ritual, they once again encountered Dagoth Ur, reborn to a new incarnation, and with divine power that could more than match their own. They were unable to enter Red Mountain's Heart Chamber, and were forced to retreat, barely escaping with their lives. Dagoth Ur had sole control of the Heart from this point on, and grew stronger while the Tribunal grew weaker. 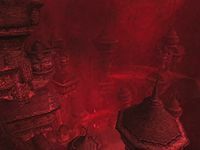 Later successes allowed Dagoth Ur to expand his sphere of influence further: at first to nearby Dwemer citadels, and then even further by means of spreading blight diseases. In 3E 417, the worst blow came: as part of a misguided attempt to recapture the Dwemer citadels, Almalexia and Sotha Sil lost the artifacts Sunder and Keening, two of Kagrenac's Tools, and had to be rescued by Vivec. Eventually, the Tribunal were forced to retire from their previously active lives and devote most of their time to maintaining the magical Ghostfence they erected to prevent Dagoth Ur's sphere of influence from spreading. Even this was only a partial success; blight-infected creatures could fly over it, and there was a passage below the ground to the lost Dunmer Fortress of Kogoruhn, the stronghold of House Dagoth in life, through which other diseased and Corprus-infected creatures could escape Red Mountain. Now possessing only one of Kagrenac's tools, the gauntlet Wraithguard, the Tribunal could not - dared not - even pass the bounds of their own Ghostfence to recapture the others. As Sotha Sil and Almalexia withdrew from the world, Vivec stood alone in maintaining the Ghostfence, an effort that took so much of his energies he could not stir out of his palace, and his Temple's Ordinators ran out of his control and became ever more fanatical and rigid as the faith of the Dunmer wavered. Meanwhile, Dagoth Ur set about constructing Akulakhan, the Second Numidium, a brass machine god he would use to conquer all of Tamriel. All this was to change with the advent of the Nerevarine. This outlander to Morrowind was the reincarnation of Nerevar prophesied by Azura who would return to rectify the dishonorable acts of his councilors. Knowing better than to dismiss the Goddess of Dusk and Dawn, both Vivec and Dagoth Ur prepared for the Nerevarine's arrival as best they could, though they did not know when, where, or in whom the prophecy would be fulfilled. The Nerevarine met with Vivec, who offered him advice concerning how to defeat Dagoth Ur, even though he knew that the Nerevarine's success, and the destruction of the Heart of Lorkhan, would mean the loss of his power as a demigod. Dagoth Ur offered him power, and the chance to use Akulakhan to drive the Empire out of Morrowind. 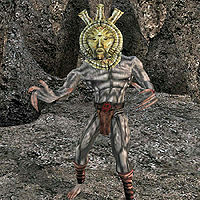 The deception, treachery and confrontation that Dagoth Ur encouraged among his followers left him unable to understand the Nerevarine: he could not deduce beforehand whether the Nerevarine sought to fight him or join him, even when the Nerevarine finally confronted him in the bowels of Red Mountain. Nerevar reborn ultimately severed Dagoth Ur's connection to the Heart of Lorkhan, at the same time destroying Akulakhan. Dagoth Ur became mortal once more, losing his divinity. Although he was nonetheless a mighty sorcerer, the Nerevarine bested him in combat and brought a final end to the ancient evil. "Dagoth-Ur" is another name for Red Mountain, and is usually distinguishable from the deity "Dagoth Ur" due to the hyphen, but the use of the distinction is rather inconsistent. As with the cities of Vivec, Almalexia and Sotha Sil, distinguishing between the place and the person depends on the context. 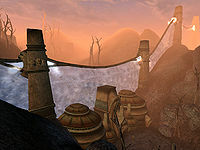 For game-specific information, see the Morrowind and Legends articles. ^ Dagoth Ur's dialogue with the Nerevarine in Morrowind.